Manchester City could clinch the Premier League title on Saturday if they win against their local rivals Manchester United.And they could make history in the process too.They'd beat United's record of winning the league with the most number of games left to play in a season.But it wouldn't be the only memorable title win in Premier League history. In the 1998-99 season, Manchester United became the first English club to win the Premier League, FA Cup and UEFA Champions League treble. 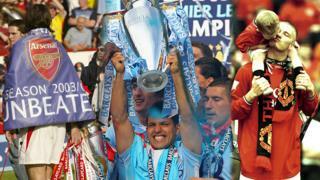 Their winning streak continued for the next two years.In the 1999-00 campaign, the Red Devils were crowned champions for the sixth time in eight seasons - finishing with a record 18-point lead.A year later, they also made history by becoming the first club to win three consecutive Premier League titles.They took the crown with five games to go - a record that Man City could take from them on Saturday. In the 2011-12 season, Manchester City's Sergio Aguero scored THAT goal against QPR in stoppage time - clinching the Premier League title with seconds to spare.Manchester United had beaten Sunderland at the Stadium of Light and all they needed was for City to lose or draw at the Etihad.Heading into injury time, Manchester City were 2-1 down and a comeback was looking unlikely.Edin Dzeko equalised in the 92nd minute which was followed by a last-minute goal from Aguero to secure the win.It was this moment that caused Martin Tyler's "Aguerooooo" commentary which is still iconic today. Up until the 14 January, Man City had some Arsenal fans squirming as the team was on track to potentially win the Premier League title without being beaten.Unbeaten is exactly how Arsene Wenger's team won the league back in 2004, which earned them the name the "Invincibles".They were the first team since Preston North End in 1888-89 to achieve such a run.And if an unbeaten season wasn't good enough, they secured the title while visiting their north London derby rivals Tottenham Hotspur at White Hart Lane. Blackburn Rovers led the table for much of the 1994-95 season, but a defeat to Liverpool on the final day threatened their title hopes.Sitting comfortably in second were Manchester United who only needed a win to take hold of the season trophy. Luckily for Blackburn fans, West Ham held Man United to a draw and victory was theirs.It was the first time in the Premier League era the trophy was not lifted by the Red Devils. In Jose Mourinho's first Premier League season, he led the 2004-05 Chelsea team to their first title win in 50 years - and broke loads of records along the way.With 95 points it was the highest number of points seen in the league - a record still intact today. They also had the most away wins, fewest goals conceded away and most clean sheets. The 1995-96 season was one of mixed emotions for Newcastle United. They were unbeaten at home until March and led the top of the table by 12 points in January.But they went on to finish second in the league - four points behind Manchester United.It did produce another famous audio clip though - this time from Magpies' manager Kevin Keegan. His rant came after Manchester United boss Alex Ferguson suggested other teams might not try as hard against Newcastle as against his side. "I will love it if we beat them, love it," he said. Man City fans will be hoping the same in Saturday's game.Follow Newsbeat on Instagram, Facebook and Twitter. Listen to Newsbeat live at 12:45 and 17:45 every weekday on BBC Radio 1 and 1Xtra - if you miss us you can listen back here.